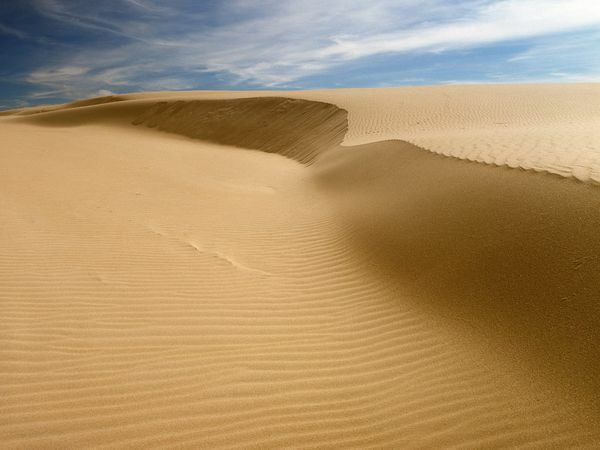 An expanse of rippled sand dunes resembles a desert landscape in Poland’s Słowiński National Park, a seaside reserve on the Baltic coast, about 71 miles (115 kilometers) from Gdańsk. In addition to the remarkable moving dunes, the ecologically diverse park includes forests, peat bogs, and marshes that are home to a variety of wildlife. Sunday’s reading of the devil tempting Jesus in the desert brought to mind all the times the devil’s work is made easier by choices made. When we ignore God‘s Commandments, every time we conveniently forget Jesus’s teaching, we make the devil smile. Not a pleasant thought to be had during Church, but one that is evidenced by how easy it is to give into temptation. How many times do we gossip about another? How many times do we make a snide comment about something? How many times do we tell a lie to make something look or sound better than it is in actuality? When my children were younger they used to say it was easier to be bad than it was to be good…and in some ways it was for them. It was easier to lie and hide their toys under the beds than put them away. It was easier to say they did their homework and could watch television then it was to have done their homework. And as adults we too may find it easier sometimes to say we are busy when asked to help out at an event, or to say we have a previous commitment when we don’t want to become involved. It is human nature some say. Or, as justification for not telling the whole truth, some believe they are protecting a person‘s feelings, or a relationship. I know I myself have justified not telling my husband the truth because I didn’t want to get him upset. I usually come clean months later and tell him I did it because he couldn’t “handle the truth” at that time. After thirty-five years of marriage he has learned to preface requests with “do I really want to know the truth?” Smart man! But this being Lent I decided to try something new. I am creating a daily mantra for every day of the week. For example today I will work on not Mentioning Other’s Negatives when talking to friends and family, even if I get frustrated, irritated, or upset with a particular person. Jesus never once said a negative comment about a person to another; He in fact defended the indefensible in his teachings. He ate at the home of a tax collector, He healed the lepers and the blind…He did what God wanted Him to do – immune to what others would say. So to honor my Lord I will try to emulate Him and Monday morning during prayers, I will ask for help in not mentioning my opinion on the negative aspects of other people. M.O.N. – something for me to work on during Lent.